When it comes to weight loss, don’t stress over the scale. Don’t cry over that extra .02 pounds that wasn’t there before you had lunch. Every day I see people walk in happy and confident, then after a hard workout get on the scale expecting to see a dramatic loss in weight and when they don’t they rarely leave smiling and step off with a sigh and something nasty to say to themselves. One of the most important things I can say is that you should never obsess about every last little stinking ounce. The weight will naturally come off and you will get into the kind of shape you envision for yourself if you just stay the course. The numbers on the scale doesn’t say much. Only a body fat test can we determine how much fat your body has. I always have to remind the ladies that muscle takes up less space than fat does. If you want a smaller, tighter and leaner frame you need to build lean muscle tissue. The scale might not reflect a huge drop in weight initially but over time the lean muscle you build will turn your body into a fat burning furnace! Your body is a wonderful bio-mechanical thing that will do it’s job perfectly fine if you let it. However, if you’re the type who obsesses over every last ounce and can’t help weighing yourself after every workout, then you’re putting your mind and your attitude in opposition of what your body is trying to do and you’ll be taking the wind out of your weight loos mojo sails. 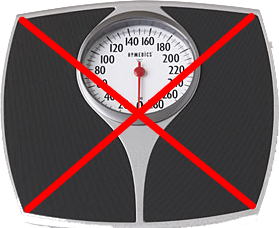 It’s only natural to want to jump on the scale after all the hard work you’ve been putting into your weight loss goals. but the scale says little about how fit & healthy you actually are. Don’t get demotivated by the weight. Eat clean, train hard and throw out the scale! Be consistent and patient with the process and you will succeed at weight loss. Go by how your clothes fit. Get a body fat check about once a month. That’s what we preach at Robaina Fitness where we don’t train you for the “apperance” of fitness but for REAL and FUNCTIONAL fitness. If your weight loss goals don’t transfer over to life than you’ll just be a skinny fat person. As a wife, mother and business owner, I know the difficulty in finding the time to maintain a healthy lifestyle. I use High Intensity Interval exercise and use this method with her group classes and private clients for outstanding results without hours in the gym.